WTH is going on here? I just released an updated version for TeaTimer 1.2.3. As usual you can download it from AMO. Bugfix for systems having problems with sound output (thanks to pheidrias for the bugreport). New possibility to have the standard system alert sound as notification sound. Visual Change: The elements in the add-on bar are now centered (thanks to William Skellenger for the contribution). Sort order for the tea varieties is now case insensitive (thanks to AMO editor Archaeopteryx for the bug report). New Translation for Czech (thanks to ondrejd from babelzilla.org). Thanks to all other translators from babelzilla.org for the locale updates. For those of you, who may be nerdy enough to be interested in this sort of delevoper-things: Some months ago I switched from SVN to git and so TeaTimer is now also on github. Feel free to contribute or dig through the source. some weeks ago I took the time to update TeaTimer. The biggest new change: It's compatible to Firefox 4 (only), so TeaTimer is back to improve your life together with this great release of your favorite browser. In this release, I also added the possibility, to use your own alert sounds. You can set it in the options dialog, by choosing the last item in the sound list ("Custom"). I also removed the not longer working Twitter feature (the old login mechanism isn't supported by Twitter anymore) and all locales except the english and the german one. But I already work on a upcoming release, which will bring back some new locales. If you're interested in doing some translation work for TeaTimer you can contact me or use Babelzilla to submit translations. Oh and by the way: You may have noticed, that TeaTimer is now flatterable, too. 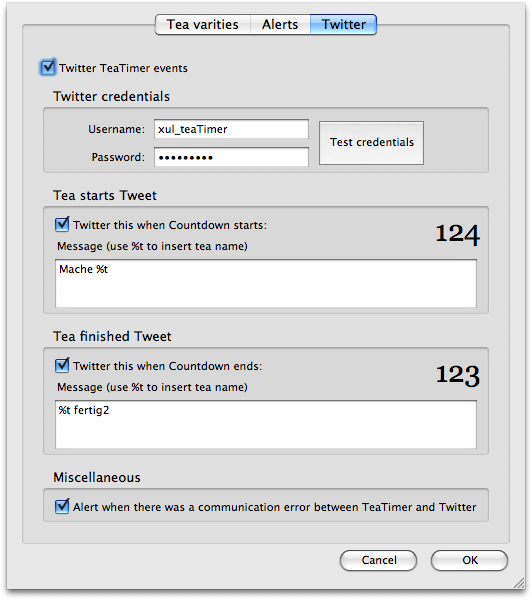 Twitter Support: TeaTimer can send a tweet when you started a countdown and/or when this countdown has finished. Thanks to the people at Babelzilla a turkish locale was added. I removed the polish locale, because it I haven't found someone who could translate the new terms needed for this version. I will come back, when the translation can be complete. TeaTimer is working with Firefox 3.5, too. As always, I´d love to read some feedback, especially on the AMO page of TeaTimer.. I hope these are useful for you. Please don't hesitate to review them on AMO. It seems, that Spambots found my bugtracker and thought that it is a reasonable target for their spamposts. I removed the spam tasks and upgraded to the neweset stable version of the my bugtracker software Flyspray. Anti-Spam-measures are planned for the next version, but the current betas didn't work and it seems, that we still have to wait some time until Flyspray 1.0 will be released. If the update will not help, I unfortunately have to remove the support for adding features without a account. I got a negative response from AMO (after 7 weeks) according to my public nomination request of TeaTimer 1.0. The reason given was mainly a lack of ratings. But there are good news: I recognized today, that the number of ratings has raised to 5, so I started with the work on version 1.1, which will include Twitter support. When this version is done, I will try my luck again and make a new public nomation request on AMO. Yeah, finally the 1.0 has seen the daylight. Let's go directly to the features of this release. The bad news first: For the english speaking users, there are no new features. But all the others may be happy to read, that TeaTimer is now available in different languages. Currently included locales are: English, French, German and Polish. I really have to say thank you to my two translators: Hannah Meyer (responsible for the french locale and for checking my english locale) and Paweł Sobczak (responsible for polish locale). They did most of the work for this release, so let's give them some applause. If you are interested in getting some honour and applause, too, you can contribute a locale in another language. Please contact me, if you are interested. Oh, and there was one minor bugfix, please look at the corresponding page in my bugtracker for more informations. Okay, enough blabla now. You can still download the extension from here, because the nomation proccess at AMO isn't completed, yet. I thought about the roadmap and decided to realize locale support first. That means, for you as user, it's possible that TeaTimer will speak your language in the next release. But, that means, for you as translator, you have the chance here of working on this new upcoming project. It's not so much work to do here, I think experienced people can do the job in about one hour. So, if you want to see your name in the list of contributors, please contact and tell me which language you want to translate for. Thank you. 1.0 is getting closer, because with these words I release TeaTimer 0.9 into the wild! Hope you like the new feature. 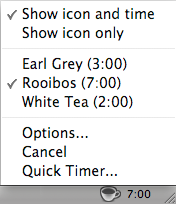 First of all TeaTimer can now sort teas in the main context menu by name or time. You can change this behaviour in the options window. This feature was realized because of a feature request from user Jan. If you have some ideas or if you need a certain feature, you can comment here or you can open a new task on my bugtracker. Apropos options window… The options window is now also available at the add-on centre of your Firefox installation. I did a bigger internal change with storing all the preferences and teas. If you want all the dirty details, see FS#13 of my bugtracker. And finally I did a clean up function, which takes care, that no garbage is left, when TeaTimer is going to be uninstalled. I hope you have some fun with the new features. If you like the extension, please leave a rating at AMO. I still want to have more good ratings, before I'm going to nominate my extension for moving it into the public area.